It might seem like the 1.2m wide rolls are cheaper than the 750mm wide at first glance, but in fact, you get more area per roll in the latter. They work out to around the same price in the end. 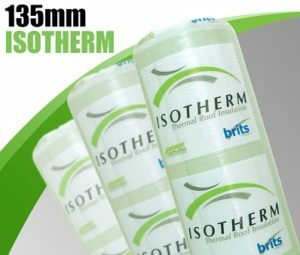 The two ceiling insulation products below are the thicknesses you should consider installing if you live in Cape Town, Johannesburg and Pretoria. They both come with a high R-value and an 11.5kg density and perfect for colder winters. The SANS building regulations in South Africa recommend using either one for cooler climates. As you can see there is not much difference in the isotherm price list between the two products. Considering this, most homeowners opt for the 145mm. 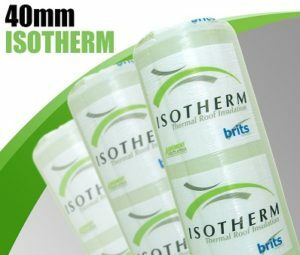 The 100mm and 75mm are the mid-range products in the isotherm range. Manufactured for climates that don’t get too cold in the winters. The SANS building regulations recommend the 100mm isotherm price list for Durban and surrounding areas in KZN. They can also be used in flat roof sections where the cavity space does not allow the thicker products without compressing them. The 50mm and 40mm are used mainly as top-up layers. Their R-values and densities are very low when compared to the higher end products. Many homes already have a layer of insulation. In these cases, considering a top-up layer might be a good option. It’s more cost effective.